On the surface of the water, an iceberg can appear small and harmless. But underneath the water’s surface, the major portion (90%) of the iceberg can pose serious threats to boats and vessels that pass too close (think Titanic). 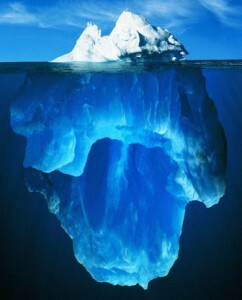 The bulk of the iceberg lives below the surface. It’s not visible to those who pass by. But it’s there. This is a powerful illustration of what it means to lead yourself first. As you consider your own life, there are parts that people can see. The behaviors, responses, and attitudes you display are observable. But there is a part of you, the inside of a person, that isn’t as easily discernable. This is the part that a leader must start with. This is the area that a leader must lead first. It’s the 90% below the waterline – the part only you can really see. Here’s the punchline to this whole illustration: Many leaders are only concerned about the 10% that people can see and do whatever they want with the 90% that’s below the surface. But leading yourself first means you’re focused on the 90%, the below-the-surface part, because you know this is what effects the 10% that people can see. People don’t always see your thinking, but they do see your words and actions. How many times have your heard someone say, “Think before you speak”? Those who don’t spend time thinking, reflecting, and evaluating are prone to making mistakes…over and over and over. They live by the philosophy: Ready, Fire, Aim! And then they wonder why they are misunderstood or always going back to clean up after their actions. Leaders who don’t spend time thinking will quickly lose their ability and opportunity to lead. People don’t always see you choices, but they do see your consequences. You have an internal compass that guides you as you make choices each day. Sometimes, that compass needs recalibrating. Whether it’s moral choices, organizational choices, or personal choices, they will all have consequences. You may think that no one is looking…that you can get away with it just this once…that you are above the law. But choices have consequences. And sooner or later, the results of the choices you make concerning the 90% that lives below the surface are going to make their way into the visible light of day in the 10%. People don’t always see your perspective, but they do see your attitude. One of my favorite quotes on leadership is from Napoleon who said that “leaders are dealers in hope.” When you enter a room, or a conversation, or a meeting – do people feel more positive or negative from your presence? You may not be able to convince everyone to share the perspective that you hold, but you can offer a positive attitude. Attitude is a choice…every time. Are you shaping a perspective underneath the surface that tries to get all you can before everyone else gets it? Or do you have an abundance mentality that realizes that you get back more than you ever imagined if you first help everyone else around you get theirs? Your perspective will be reflected in your attitude. People don’t always see your discipline, but they do see your results. When others look at a professional athlete, they marvel at the abilities on display. What they don’t see is the day in, day out rigors of training that took place in order to achieve that success. Many wonder what it takes to write a book? It takes writing…one page at a time. Leaders realize that results – successful results – come at a price and are determined to do what it takes to pay that price. John Maxwell notes that one doesn’t become a leader in a day, but daily. Every day – doing the right things. If you want to make some changes as a leader you have to ask yourself: What needs to change on a DAILY basis in order to make that happen? People don’t always see your growth, but they do see your improvement. Growth is not automatic. It is a movement in a certain direction. We all have bad days. We all make bad decisions. We all make mistakes. We all miss a day on the treadmill. But growth is more than one day’s mistakes. It is a certain trajectory over time. In fact, growth often occurs because of the bad days if we’re willing to learn from them. Learning from our mistakes means taking the time to think about them, choosing not to do the same thing, altering our perspective, and engaging in a new daily pattern that leads to a different result. As I come to a close here I’m thinking about my own life. There have been moments where I’ve been able to fool people with the 10% that they can see. I’ve put on a good face and acted in a way where they believe that I’m better than I really am. At the time, no one knew any different. But I knew. I knew that the 10% I was showing didn’t line up with the 90% that I was really living. I was playing a game, both with them and with myself. I am learning from those experiences. I trust you are as well. We may be able to fool people in the moment, but over time, the 90% has a way of showing itself above the waterline. Be the type of leader who leads yourself in such a way that you can be authentically you 100% of the time. This is so true, and I hadn’t looked at it this way before. I particularly appreciate your insights about attitude and improvement – they really do make all the difference. Thanks for some great posts, Tim, I have just signed up to your blog, having found it through Kenneth Blanchard’s page, and look forward to reading others in future. Lynn – glad you found my site and I’m grateful that you have taken the time to comment. Welcome!